1. Boddhobhumi. The Martyred Intellectuals memorial in Rayerbazar. On December 14, 1971 members of the Bangali intelligensia were picked up by the Pak Army and their collaborators, tortured and brutally murdered. Their bodies were dumped into a brick field in Rayerbazar and left to rot. 2. A list of the victims of the Kalibari killings. 3. The foundation stone of the memorial for victims that included teachers, students and university staff, of the Jagannath Hall murders. 4. 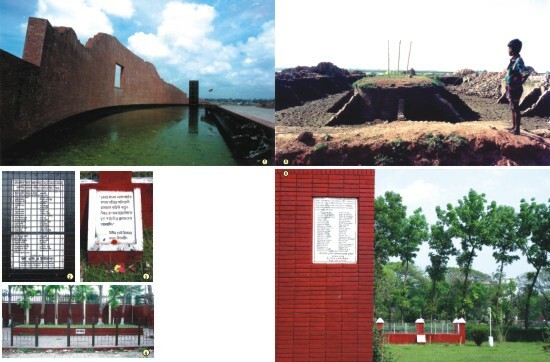 A mass grave at Mirpur's Martyred Intellectual's Memorial. 5. The original Rayerbazar killing field before the monument was built. 6. The mass grave of Jagannath Hall. During Operation Searchlight, students, teachers and university staff were lined up and brushfired upon; their bodies were thrown into the makeshift graves. 7. 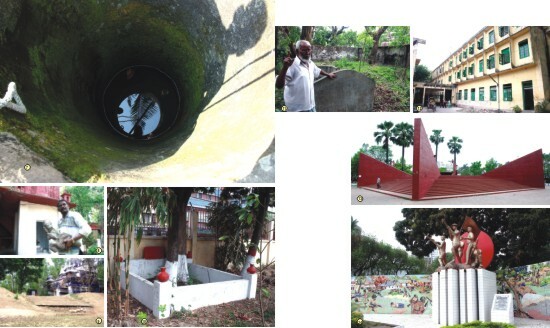 A well at Dhaka University's Shib Bari (Shiva temple). On that fateful night, members of the Pak Army raided the temple and killed all the inmates and then dumped the bodies into the well. 8. During the March 25 raid many of the Pak Army bullets destroyed the statues of deities at the Shib Bari including one of Hanuman which was later retrieved from the pond. 9. Kalibari of Ramna. Among the victims of the march 25 massacre were innumerable Bangalis killed at this site where Kalibari, one of the largest and oldest Hindu temples of Dhaka, was located. 10. A mass grave at Rajarbagh Police Line. 11, 12. Abdur Sobhan, a survivor of the March 25 massacre at Zahurul Haque Hall, DU near a grave where four martyrs lie in eternal sleep. The main building of the Hall was firebombed by tanks. 13. The Martyred Intellectuals Memorial at Mirpur. 14. On March 25 the Pak Army attacked the Rajarbagh Police line killing hundreds of Bangali policemen who died trying to defend themselves.